Nelson-Atkins Museum of Art – Founded in 1933, the Nelson-Atkins is the most prestigious and well-known museum in the Kansas City region. Its recent expansion in the form of the Bloch Building (pictured) was awarded TIME Magazine‘s “#1 Architectural Marvel of 2007.” The Nelson-Atkins collections house over 33,500 works of art ranging from the ancient to the contemporary, from African to Asian. The museum offers tours, classes, and other programs for children, families and community members. Kemper Museum of Contemporary Art – Since its opening in 1994, the Kemper has collected approximately 1,000 pieces created between 1913 and the present. The Kemper prides itself on providing about a dozen special exhibitions each year, presenting contemporary art of high quality and significance. The Kemper provides educational programs for the community including children, families and teachers. They also produce ARTcasts, a series of podcasts, in collaboration with local radio station KCUR 89.3. Nerman Museum of Contemporary Art – The Nerman is the art museum of Johnson County Community College. 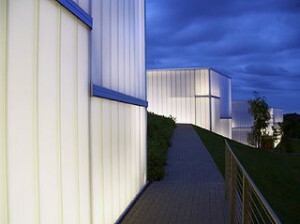 It opened in 2007 and is housed in a minimalist building of Kansas limestone, designed by Kyu Sung Woo. The Nerman contains 10 galleries and hosts sixteen temporary exhibitions each year. The collection is a mixture of outdoor sculpture, paintings, ceramics, photography and works on paper – all from the 20th and 21st centuries. Spencer Museum of Art – The Spencer is in the heart of the University of Kansas Lawrence campus and is open to the public, in addition to supporting and contributing to teaching and research at the University. With almost 36,000 pieces, the Spencer Museum’s collection includes ancient to contemporary Europe and American art, as well as Asian, Native and Latin American, and Australian pieces. The Spencer houses children’s classes and community and events. The museum also collaborates with Kansas Public Radio to produce the Spencer Art Minute. These institutions all provide intriguing exhibitions, whether permanent or temporary. Another valuable component they all share is that admission is always free to the public, making the artistic wonder of the ancient and contemporary worlds accessible to all in the region.